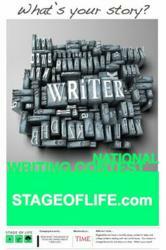 Writing Resources: StageofLife.com announces the launch of its writing resource section to support educators and parents looking for writing prompts, writing contests, classroom posters, mentor texts, lesson plans about blogging, and other student writing and blogging resources. Last year, over a quarter of a million teachers, professors, parents, teens, and college students visited StageofLife.com, a writing resource and blogging community that welcomes everyone from teenagers to Baby Boomers to share their life experiences by uploading a personal essay to the website. What started as a simple concept of changing the world one story at time, has grown into an international, multi-generational literacy initiative, and one that is being used by Secondary Language Arts teachers who are looking for easy-to-use student writing tools to encourage teens to write outside of class. Because of the hundreds of thousands of student and teacher visitors coming through the website, Minnesota natives, co-founders, and cousins, Eric and Joe Thiegs, realized it was time to introduce a more formalized writing resource section on StageofLife.com for Language Arts teachers using the portal as an extension of the classroom. Stage of Life CEO, Eric Thiegs, was inspired to launch the start-up company after hearing stories from his wife, Rebecca, a 14-year high school Language Arts teacher, talk about how a larger percentage of students were coming to the classroom unprepared to write each year. "Today's Gen Z and Gen Y (the Millennials) students are growing up 'Facebooking', Tweeting, and Texting. These new forms of writing can't be ignored, but we also need to keep teens connected to essay writing, or even blogging, that will help them think and process creative thought at a deeper level. It's that type of writing which will help young writers grow in college and their careers," said Thiegs. In order to inspire more students to write and blog, Thiegs wanted to create a writing platform in the marketplace to inspire teens to break out of the short-format writing style prevalent in social media or on mobile phones. He now uses StageoLife.com to issue a real-world writing prompt for teens and college students every month, encouraging students to write for themselves, outside of the classroom, on a topic that is relevant to their life. 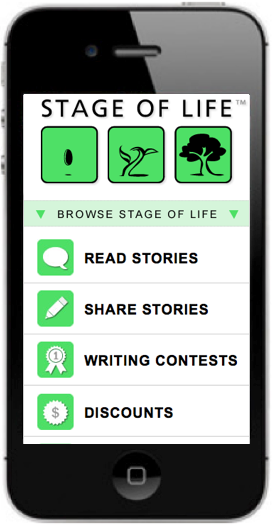 Students can submit an essay from their computer, or now, thanks to its new mobile storytelling website, people can submit their essays and life stories directly to Stage of Life from any smart phone by visiting StageofLife.com from their phone's web browser. And there are prizes for the winning essay writer each month from Stage of Life sponsors such Fandango and Papa John's to boot. "We are a grassroots, literacy and writing initiative founded with a mission to create life-long readers and writers, and if we can help teachers get their students writing outside of the classroom, whether that's through an essay submitted via a computer or smart phone, then we've just helped another student explore the love of writing," stated Thiegs. StageofLife.com was founded in 2009 as a privately held company with an educational mission to encourage life-long readers and writers through its blogging community designed for all generations, from teens to Baby Boomers. With over a quarter of a million teen and teacher visitors each year, 5+ million uploaded words, nearly 10,000 contributing blogger members, and thousands of submitted essays, it is becoming the world's largest collection of multi-generational stories. 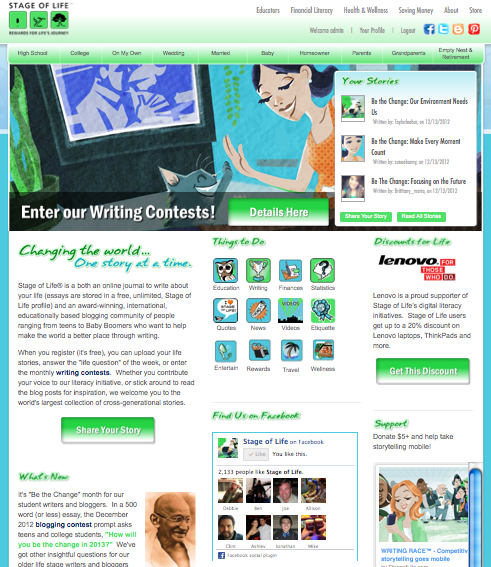 The site features free writing resources ranging from international writing contests, free blog resources, Language Arts lesson plans about blogging, goal setting worksheets, writing prompts, and more.